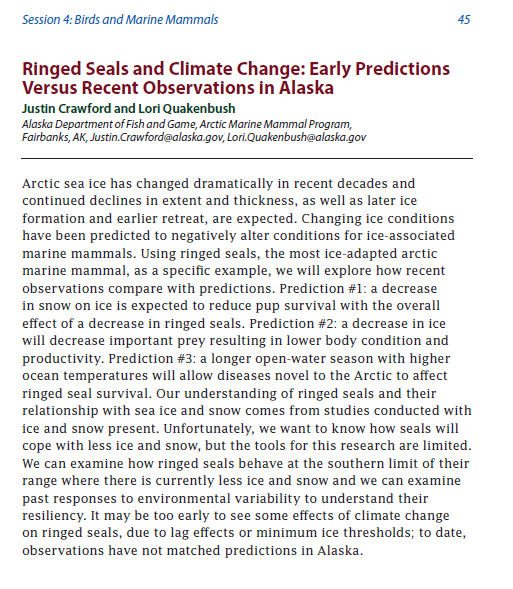 Times have changed: where once many scientists worried that polar bears could not survive an Arctic with 40% less ice, now the concern is that people of the Arctic might not be able to keep themselves safe from growing numbers of increasingly fearless bears. International Polar Bear Day is tomorrow, 27 February. It’s a good time to reconsider polar bear conservation in light of current realities. Polar bears are not threatened with extinction by loss of sea ice habitat but continue to thrive in spite of it (Crockford 2017). Fat bear in August 2017 outside Arviat, Nunavut. Gordy Kidlapik photo. Tomorrow, the 2018 State of the Polar Bear Report will be released. But for now, see some of the failed claims below. According to a report by CBC News earlier this week (18 February 2019), there was a defence kill of a potentially dangerous polar bear and her cub in Foxe Basin, Nunavut on January 4th that we are just hearing about now. Yet another bear on shore in winter, when there is plenty of sea ice, looking for food in an Arctic community and threatening the lives of its residents while a polar bear specialist blames such incidents on lack of ice. The state of emergency in Belushya Guba on Novaya Zemlya is over, according to a report yesterday from the Russian news agency TASS (18 February 2019), as no bears had been spotted over the previous 24 hours. Seriously, if the bears were coming for us, people in Belushaya Guba would have died already, probably EATEN. These particular bears know there is stored food and refuse available that does not come packaged in human form and they know from experience that humans won’t hurt them. As I pointed out in my last post, these bears have known this since early December, when they chose to stay on land over the winter and ignored the sea ice when it arrived. Lack of sea ice is not the problem here. These are habituated garbage bears that are no longer safe to have around: the responsible option is to shoot them. It’s harsh, I know, but the population will recover from the loss. If you suddenly cut off their passive food supply (fence or close the dump, deal more carefully with individual refuse and stored food), all of these bears in the photos and videos being flashed across the Internet will become desperate and truly dangerous. Remember, just last summer an emaciated, desperate bear almost killed a cruise ship guard: he had a loaded gun and was actively looking for bears, yet the bear managed to ambush him. He’d have died if he’d been alone. Of course the refuse and stored food problem needs to be dealt with, in Belushaya Guba and elsewhere across the Arctic, but these particular bears cannot be saved. Cleaning up these issues takes time, coordination, and money. Ask Churchill, Manitoba, who for years wrestled with these issues before a workable solution was agreed upon. And while few Arctic communities can afford to do it the Churchill way, virtually all must contend with the very real threat of polar bears both inside and outside their communities. Ask the Inuit of Arviat and Naujaat, who each lost a young man last summer to a predatory attack by a polar bear that happened well outside their respective villages and where lack of sea ice was not an issue. Blaming this on climate change is the Paul Nicklen starving polar bear video all over again. You remember the one, the video that National Geographic got so much push-back about that they had to make a public apology for spreading misinformation? Do climate change promoters really need another fiasco featuring polar bears? Large group of polar bears at the Belushya Guba town dump on Novaya Zemlya, Russia. From the 11 Feb. 2019 story at The Daily Mail. UPDATE 11 February 2019: The international media have gone mad for this story and some photos are now available. Best series of photos and video is at The Daily Mail, UK (11 Feb 2019: State of emergency is declared after more than 50 polar bears invade Russian town and ‘chase terrified residents’). No new information is available on the story itself but plenty of hyperbole has been added. The photos show how fat and healthy these so-called ‘desperate’ bears are, which makes the claims that global warming is to blame for the crisis even more ludicrous (see the ice charts below). So far, the most over-the-top take on this goes to the Washington Post (11 Feb 2019: A ‘mass invasion’ of polar bears is terrorizing an island town. Climate change is to blame): they went to the most trouble to make the link to climate change and bring up the vilified ‘starving polar bear’ video that National Geographic was forced to apologize for last August and the debunked 2007 prediction that 2/3 of the world’s bears would be gone by 2050 (Crockford 2017). The Guardian‘s effort is weak by comparison, as is CNN‘s. The news outlet (not a blog) Daily Caller has some quotes from this page. Competition amongst bears for scarce natural resources in winter makes dump sites and stored food available around Arctic communities all the more attractive. When polar bear numbers are high, as they are now, this competition can get fierce. It’s no wonder the bears don’t want to leave.